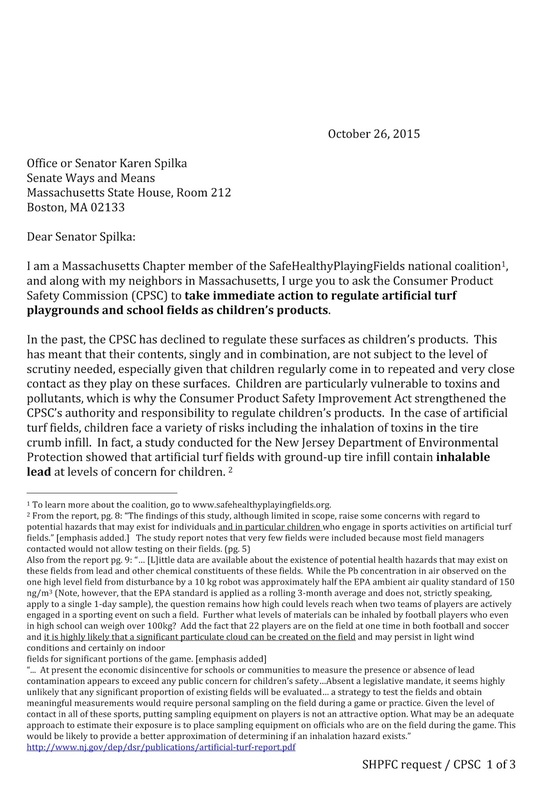 Two weeks ago, the House Energy and Commerce Committee sent a letter to the Environmental Protection Agency Administrator looking for more information about the safety of crumb rubber fields. The deadline for the response was November 6. The EPA failed to adhere to the deadline. On Friday, EPA spokesperson Liz Purchia told NBC News that the agency was “in the process of responding” to the Energy Committee’s list of questions. 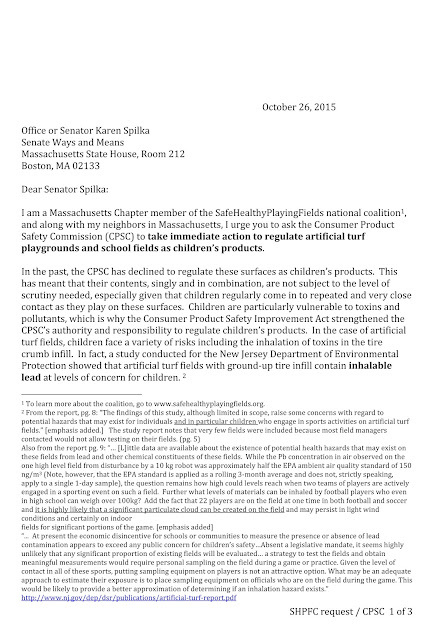 After the congressional letter was sent to the EPA, two senators urged federal officials to lead an “independent investigation into the health risks of crumb rubber” turf, a surface made of recycled tires used on playgrounds and athletic fields across the country, according to NBC. The full letter can be seen here. 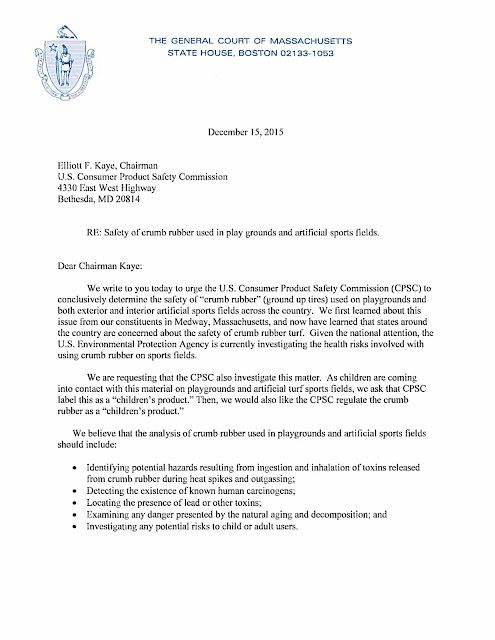 In May, Kaye testified before congress regarding the CPSC’s stance on the stance on the safety of artificial turf. His response to representative Pallone is incredible. He basically says that a 2008 report that said crumb rubber used in artificial turf field “is safe” did not mean to convey to parents that the turf fields “were safe to play on.” and that the 2008 report does not reflect the CPSC’s current views. You can watch his testimony below. 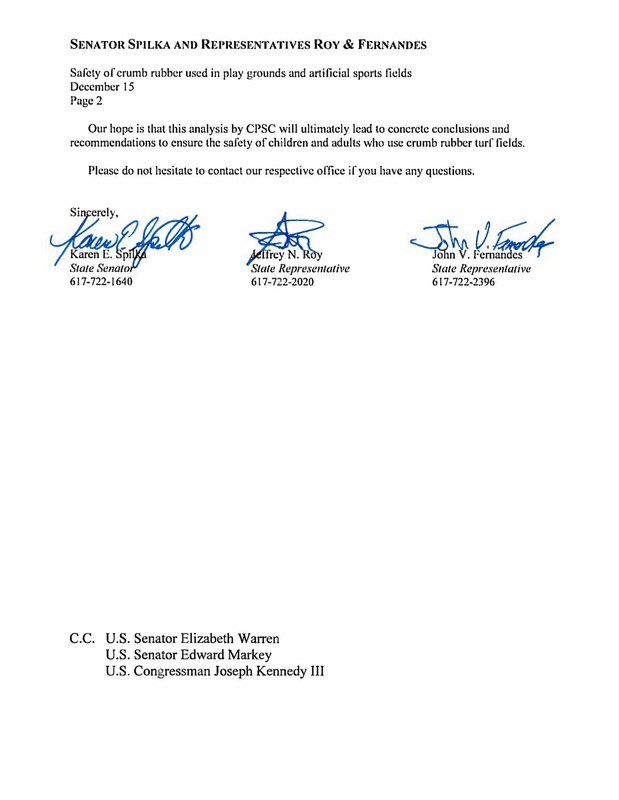 But the CPSC seems to be moving in the opposite direction of what congress and the senate would like. 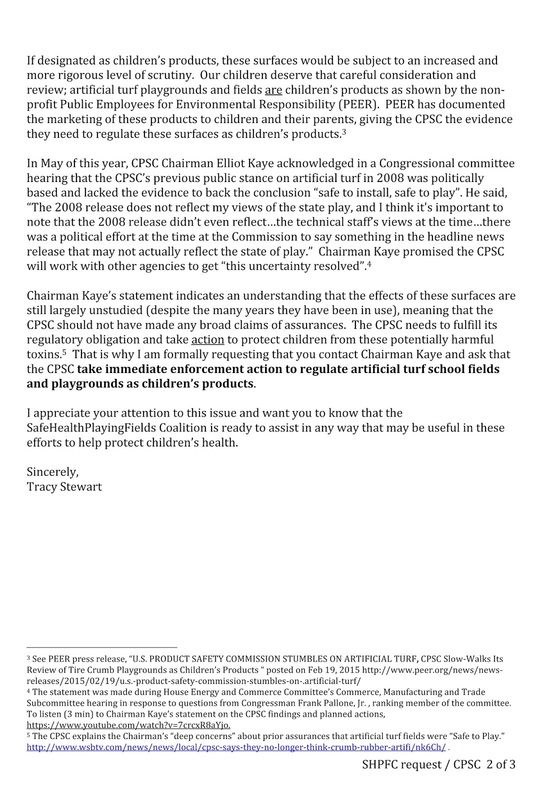 Last week, Public Employees for Environmental Responsibility (PEER), a national alliance of local state and federal resource professionals, reported that the CPSC has decided not to enforce toxic lead limits required by law for children’s products in artificial turf playgrounds, and that the CPSC has been unable to supply a cogent explanation for this action, even in the face of litigation demanding relevant records. So what the agency said in 2008 doesn’t mean artificial turf is safe. But the CPSC also won’t say that turf is not safe. And they don’t have, nor are they likely to ever have, enough information to rule on the safety of artificial turf. The House and Senate need answers. MEDWAY - After months of debate over the safety of artificial turf fields, the Board of Health voted Monday to recommend placing minimal-language signs on the three fields and to work with the parks department and school district to draft a policy or regulation. The debate comes months after an NBC News report about the research of Amy Griffin, a soccer coach at the University of Washington who has compiled a list of soccer players – who played on turf – that have developed cancer. Since then, the state Department of Health, citing several recent studies in other states, said that adverse health effects are not likely. “Although exhaustive research has not been completed, the available studies have shown that although (artificial turf field) components contain chemicals in the material itself, exposure opportunities at levels measured do not suggest that health effects are likely,” the document reads. 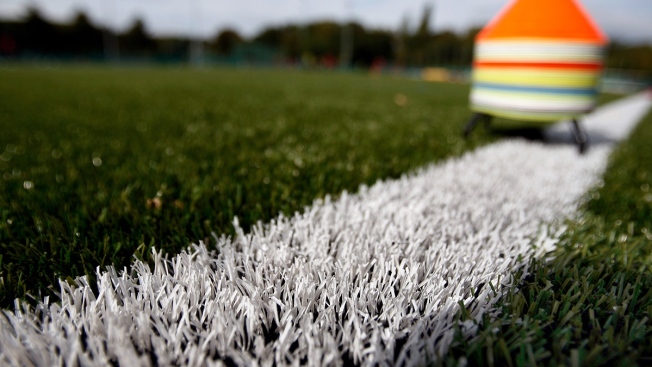 But opponents of artificial turf in town also cite the ability for artificial turf fields to reach extreme temperature during hot and humid weather. Tracy Stewart, who has been among the most vocal in the debate, sent Health Agent Stephanie Bacon documents recording surface temperatures of the town’s three turf fields, and in each case, the temperature on the turf field reached well over 130 degrees while the air temperature was in the low 80s. However, Board of Health Chairman Michael Heavey said the recordings may not be entirely accurate, as the devise used was an infrared thermometer, which does not measure air temperature. “It’s more about what the ambient temperature around (the turf) is,” he said. Parks Commissioner Paul Mahoney said temperatures on the running track and tennis courts also become very hot in the summer. “Without doing proper testing I think it’s irresponsible to continually hammer that,” he said, adding that he does not have a “problem with a sign” simply stating that the fields can become hot. Athletic Director Rob Pearl said Hanlon Field, the main football field at the high school, has been there for more than 10 years, and a death on the field was attributed to a student’s heart condition. Pearl added that coaches and trainers are given a handbook of safety guidelines regarding concussion, player safety and heat acclimation. “All coaches have to follow and look at what the rules and guidelines are,” he said. Resident Allan White, a youth soccer coach, said he’s been to Board of Selectmen, School Committee and Board of Health meetings and the “community is not working together” on the issue. Bacon said she will contact Interim Superintendent Armand Pires to work on drafting a regulation or policy and to set up a joint meeting between the Board of Health, the Parks Commission and the School Committee.